I've been using this ear trainer and it occurred to me that I would like to have it show the guitar neck turned sideways, so it's oriented like tab. 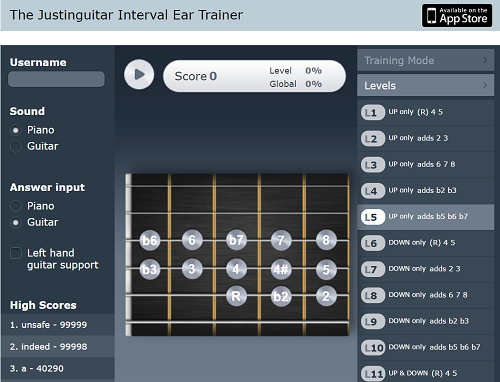 Since I've spent about 500x more time reading tab than reading vertical neck diagrams, I'm way more keyed into seeing the neck that way, so it seems like it would make it easier to apply this interval training to my guitar playing. So I made a Chrome extension to make it happen. It's really simple; it just has to add a few lines of css. Is there a problem with the ear trainer at the moment? I find it really useful and have been unable to use it for the last couple of days. I would buy the app if there was an Android version, which would obviously solve my problem. Any help would be appreciated. Is there a problem with the ear trainer at the moment? Same here. The ear trainer does not seem to load. Perhaps related to the new forum? I didn't use it until today, it initially just sat there with a white box until I noticed a little shield icon with a red x on the far right of the address bar in my web-browser (Chrome). Clicking this told me the page was using scripts from unauthenticated sources which were blocked for safety and gave me the option to allow them. Then it worked. Maybe that helps, if it does please post then we can submit a bug report knowing it's the same issue. I kinda like it better this way, it doesn't clutter the screen with all the site navigation. I was wondering how much work it would be to be able to repeat the last interval that was played after you just answered. Sometimes I find myself really being sure of my answer. When I then answer wrong, I'd like to be able to hear it again to kind of link that sound to the right answer.